It has been two years since Bella has had her bone marrow transplant. With every year that passes her chances of surviving increase and her chances of relapsing again decrease. The consultants say if we get to five years then the chances of relapse are hardly anything at all. The first year after her transplant was probably the most difficult. She suffered badly from the effects of all her treatment and it took a lot of tears, energy and love to get her where she is today. She was able to start school and is catching up with all of her friends. Today she is a happy little girl and has forgotten all of the trauma she has been through. We still attend regular hospital appointments and she will need to attend these appointments until she is 20 years old. She will need a bit more treatment in the future but until then she is enjoying being a six year old. Her resilience and determination amazes me everyday. Nothing is too much for her and she has the kindest most loving soul. I’m so proud of her. For the first time in three years I can say Bella is doing great. She’s back at school and again for the first time in three years we’re going to spend Christmas at home and not in hospital. I can’t believe what she’s been through and now it’s like it’s all finished and we can get on with life again. I’ve found it very hard adjusting and am suffering from PTSD but apart from that we’re all okay. Even when you go through the worse times there are good stories after all. Here’s one of us recently away for the weekend with Bella’s step brother. Bella got very bad GVHD of the gut and we spent the whole of November 2016 in our local hospital as she couldn’t eat anything. Then at Christmas, Bella had a urine infection which then got into her blood due to the lack of her immune system. She then had sepsis and was about an hour away from being in intensive care. We spent the whole of December in our local hospital. We came home on Christmas day to be admitted again on Boxing Day. Bella’s body swelled up to triple the size, her blood pressure was sky high and her kidney was failing. We got transferred to the biggest children’s hospital, where we were told to prepare for the worst. 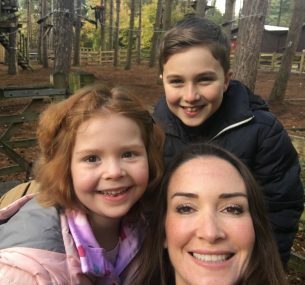 Bella had the adenovirus in her blood which was multiplying rapidly, she had developed diabetes which couldn’t be controlled, her blood pressure was so high it was dangerous and again couldn’t be controlled. She also had developed a disease called thrombotic microangiopathy (TMA). This disease is life-threatening and most patients don’t recover from it. The disease is so rare it had only been given a name five years ago and the only medicine that helps with the symptoms is from America and costs £500,000. So we were told that the biggest children’s hospital had the money and would apply to America for the treatment. So after an agonising time through January and February she got the treatment and it started to help. We’re now home and have to visit the hospital every week as an outpatient for the treatment. Bella has changed so much facially as was so swollen and poorly, it was awful. Everyone thinks that having a bone marrow transplant is the end of the road and you can go home and enjoy life again but it’s the total opposite. It was all the effects from the meds and this TMA disease which she got due to the meds and the bone marrow transplant itself. It was such an awful time. The photo was taken when she was a lot better and recovering at home. Facially she is still very swollen but so much better than she was. I am writing our story whilst sitting in our hospital room. I have been here for a month with my four year old girl, Bella-Rose. 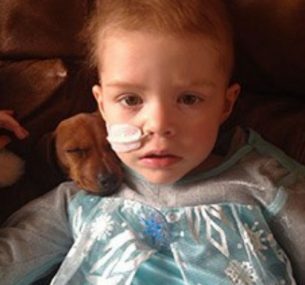 Bella was being treated for acute lymphoblastic leukaemia and has relapsed. 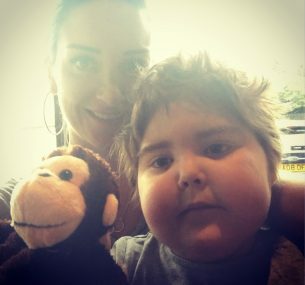 She had a year left of treatment. She was doing so well at nursery and had just started to really enjoy life again when we were given this devastating news. 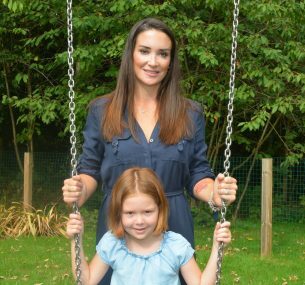 Bella was extremely unwell when first diagnosed. In fact she was so poorly that she nearly ended up in intensive care. Our lives had stopped. 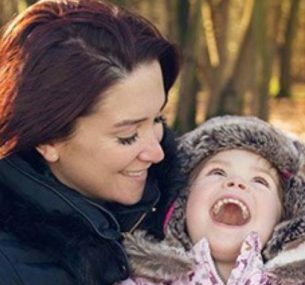 I held my little girl in my arms for days, while trying to come to terms with the fact my three-year-old had cancer. It tore us all apart. It broke me to my soul. But she came through it and our lives started again. We could enjoy the little things like trying to spot birds on the way to nursery, playing with our sausage dog, or just being at home together. We are now back in hospital and have signed forms for a relapse protocol involving the most intense chemo. It’s an illuminous blue and so strong that all her beautiful red hair, that had just grown back, is falling out again. In a matter of seconds our lives have been snatched away from us again. The holidays we had booked have had to be cancelled since Bella cannot now leave the country for a year. I won’t be able to watch my friend getting married abroad and once again my life, and everything I had fought to build up over the past year, is gone. Here we are again, at her bedside, watching handfuls of hair falling out and the side effects of the chemo slowly taking over her body. She has been in such pain – unable to eat, drink or even speak for over a week. Her mouth swelling is so bad that the nurses thought she was having an allergic reaction to something. As before, I sit in the chapel here at the hospital crying so much my tears flood the floors. I wake up during the nights crying. And Bella’s consultant has told me that if she was to have a transplant she would have an 80% chance of relapsing again. During all of this I am still training for the marathon. It gives me a purpose to what feels like a hopeless existence. Running the marathon was always on my bucket list of things to achieve. 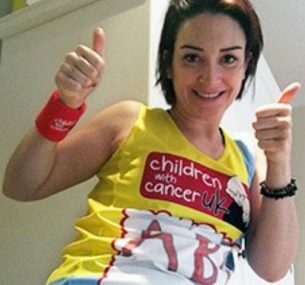 I signed up to run for Children with Cancer UK because they provide vital research and funding to help find better treatments for childhood cancers. I run with purpose. I run with a lot of tears and a broken heart. I run and run and keep on running. Abbie successfully completed her 2016 London Marathon and we caught up with her at the London Marathon Expo before this year’s London Marathon. 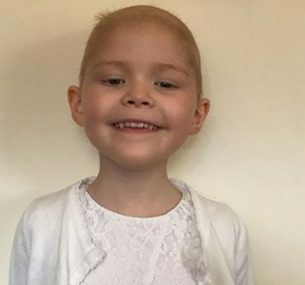 In the video below Abbie tells us about running for Bella-Rose and other children with cancer. Alice’s mum, Jane, noticed her daughter’s tummy was a bit swollen and that she wasn’t very hungry. Alice was four years old. Jane tells us their story.